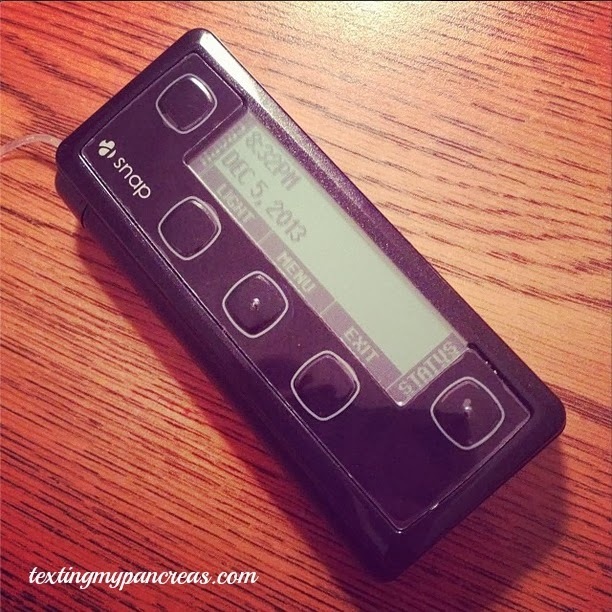 Texting My Pancreas: Review: Asante's Snap Insulin Pump. In my recent search for a new insulin pump, I was able to try out Asante's Snap for a few weeks. (They offer a free trial to those who qualify.) I mentioned this in an earlier blog post, pointing out some "first impressions". while you're interacting with it. Now that I've had a good amount of time to educate myself on how it works, and specifically how it would work for me, I'd like to share a few thoughts. I also did a shorter video showing just how the super easy cartridge change-outs works, since that's one of the main features Asante likes to point out about the Snap. I found it to be as simple as they make it seem. If you'd like to try out the Snap too, contact Asante and see what's up. Now for a few days without blogging. Vlasnik OUT! *Two things: the bit about not having a touch bolus option? I was uninformed! The Snap can do that; I just didn't have my demo pump programmed to do it. And second: the "no software" problem has now been resolved; Snap is compatible with Diasend software. Huzzah! Can you do a blog post on your "Top Ten" of insulin pump features? I'd be curious to know! Thanks! Ha! I actually don't have a *firm* Top Ten, but now I might need to create it! Great videos -- this is very helpful not only in deciding what my next pump will be, but what my next pump WON'T be (you had a couple of digs in there towards Animas). I'm with you, I want to like the Snap -- I really do -- but there are a couple of dealbreakers (i.e. vibrate mode. I'd even be willing to switch back to Humalog to try it!). The lack of interaction with a meter or CGM is also disappointing, but expected given it's Asante's first pump. Now that the big regulatory hurdle has been overcome, hopefully the smaller additional features will lead to a more expedited review of their next version. Or maybe someone else will pick up on a few of these features. Among my top-5 nagging annoyances with diabetes is the air-bubble-problem. Not needing to worry about that would truly be a blessing. A few questions though -- wouldn't you need to tell the pump how long your tubing is (perhaps just once) so that it can prime it appropriately, or do they only offer one length? (I see you used their version of the Inset/Mio which I recall you weren't too fond of). Also, how do you feel about the display -- not the "old" (not even retro!) look of it, but the wide but short display -- does it make it difficult to read or require a lot of extra scrolling? Thanks for this -- it's very helpful. I'm sorry to hear that my wording came across as a "dig" at Animas - the Ping is a good pump, but not meeting my needs so well anymore. And I'll certainly miss their remote bolus feature. Here's where you can find more info on Asante's infusion sets: http://www.snappump.com/infusion-sets I used the longer tubing, and after the "prime" and a one unit cannula fill, the pump showed that I had 298 or 299 units to work with. My understanding, and contact Asante if you want the official answer, is that the pump would push out the same amount of units from the cartridge, no matter the tubing length. The pump is ignorant of how long your tubing is. I've actually been using Insets for the past couple of years, and once I got over the learning curve, liked them enough to keep using them. This review was a great read/watch. Well said, Kim. And I totally agree about the accessories. As to the touch bolus, it does have that feature. It's just that you would lose the quick access (saving three button presses) to the Smart Bolus input if you were to set the right button to be your touch bolus button. Oh! Thank you; I had forgotten about that setting. Without an option to set the volume to vibrate, though, I'm not sure I'd be able to use the touch bolus button how I'd intend to (through clothing, not looking at screen, while being discreet). I don't like the look of the Snap at all. The pumps should be getting better looking and more modern not looking like its the first pump ever made. I would actually prefer my pump to be heavier and not to feel like a toy. I tried the Omni-pod when it first came out. I almost went into DKA twice because the cannula came out int the night. Also I wasted bottles of insulin because I had to keep replacing the site. Iv'e been afraid to try the new ones that some out since then. I got the Animas and NEVER had any problems with it. I love thats its waterproof thats a big deal to me. :) I would like to try the t-slim though its a reliable looking pump. Thanks Kim, it is much appreciated. So what pump did you end up getting? I assume since this blog was back in January, you've made a decision. I am in the upgrade process as well and want to make sure I cover all of my bases. Thanks for your review. IMHO, as a long-time pump user, the FDA is taking a one-size-fits-all approach to the user interface on pumps and that one size assumes the user is a child or parent of a child with diabetes. In other words, lots of alarms and confirmations that slow down and exasperate those of us who have used multiple pumps.